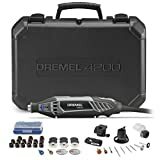 Dremel 4000 vs 4200 Rotary Tools: Which One’s Best? Here’s a little bit of trivia for you. Did you know that the first tool sold by Dremel was an electric razor blade sharpener to replace manually putting an edge on razors? You can see how far Dremel products have come since those early days. And, in case you missed it, Dremel is diving into the desktop fabrication market with both a CNC machine and a laser cutter. Today, we are looking at two of the “basic” rotary tools currently offered by Dremel, comparing their features, so you have a better idea of which is better for your needs. No time like to present to get started, so here goes. If you need to perform any grinding, etching, polishing, sanding, cutting, drilling (whew! ), or related task on a smaller workpiece, there isn’t a tool much better suited to it than a Dremel rotary tool. These dynamos reduce hours to minutes for such tasks. Either of our options is going to serve you well in such situations. In just a moment, you’ll see the cool little difference between the 4000 and 4200. With years of having a Dremel in hand, we think you’ll like the convenience of what the 4200 brings to the party. Stacking up a handful of key characteristics between these two siblings in the Dremel rotary tool line will let you see they share a lot of DNA, and that either tool is going to make your life easier when you need the capabilities they provide. Public Service Announcement: We caution those of you out there with an aversion to the sound of the dentist’s drill; you may experience discomfort at certain speeds using certain accessories! Dremel has equipped both the 4000 and the 4200 with a variable speed-controlled, ball-bearing, 1.6A motor. A dedicated speed control allows you to select between 5,000 and 35,000 RPM. The beauty of this design is how it allows you to pick the correct speed for the job. The tool retains this setting, even after you turn it off. This functionality lets you change your attachment or accessory, turn the tool back on, and have the same speed as before. It’s great for consistency in working your material. With the 4200, you don’t have to fumble with a small collet wrench to change a bit or add an attachment. In the 4200, Dremel uses an innovative collet design that allows you to change out your desired bit or burr with a simple twist. The same technique has been available on cordless drills for years. Uses all the Dremel attachments and accessories – Point to the 4000, or is it? Contrary to the marketing text, the 4200 cannot use every Dremel attachment and accessory that the 4000 can. The culprit behind this is the 4200’s wrench-less collet design. You may find it a small price to pay for the ease of change provided with the 4200. And, given the vast array of things you can attach, it may not be an issue. Price – Half point to the 4000, but compare apples to apples! Here is a little secret about how to decipher Dremel rotary tool model numbers. But you have to keep it to yourself, got it? If you don’t, well, it’ll be no more secrets for you! Dremel model numbers tell you three things, at least for the Rotary line: model number, number of included attachments (edge guide, router guide, etc. ), and number of included accessories (bits, burrs, sanding disks, cutting disks, etc.). For example, the 4200-4/36 kit includes the 4200, four attachments, and 36 accessories. The nearest comparable model for the 4000 is the 4000-4/34. The 4200 is more expensive than the 4000, but price comparisons are tough because the included items vary between the two kits. Variety means you’ll have to pick the kit that benefits you the most. The 4000 is pretty close to the method of changing things at the business end of the tool. Sometimes it is hard to improve on an original. The 4200 breaks with Dremel tradition when it comes to its collet, and that can be a great benefit to you when working on projects that require a wide range of material “transformation” to get the job done. In the past, you needed to talk to someone, rely on the advice of a favorite relative, or enlist a salesperson to help sort out the good and bad. Today, the ability to research online enhances these time-tested methods! We’re here to help in the research department, pulling together some of the reactions from folks who have real experience with the 4000 or 4200. People recommend adding a Dremel to your toolkit, especially if you do a lot of crafting and work on small pieces. Why? They find it easy to control, and with the vast number of things you can attach, the sky is pretty much the limit of what you can tackle. They also report liking the durability, quality, and power provided. A common recommendation is to buy a kit, so you can get right into your projects instead of making a trip to the store. Others are not so pleased and report issues with the motors and switches burning out rapidly. Also mentioned are issues regarding the quick-change collet not being all that easy or durable. On the positive side, people experiencing issues are generally satisfied with their dealings with Dremel customer service. Time to announce a winner. Envelope, please. The 4200 is going to benefit you in the long run because of the tool-less collet. Less time changing tools out means more time for projects or other things! Manufacturing defects are going to happen, so if something goes wrong with your Dremel 4200 or 4000, exercise the warranty immediately. You kept the receipt, right?